"In the year 1987, NASA launched the last of America's deep space probes. Aboard this compact starship, a lone astronaut, Captain William "Buck" Rogers, was to experience cosmic forces beyond all comprehension. In a freak mishap, his life support systems were frozen by temperatures beyond imagination. Ranger 3 was blown out of its planned trajectory into an orbit one thousand times more vast, an orbit which was to return Buck Rogers to Earth, 500 years later." Buck Rogers in the 25th Century is an American science-fiction series that ran from 1979 to 1981. The feature-length pilot movie was released theatrically several months before the series itself aired, inspired by the success of Star Wars two years earlier. The film and series were based upon the Buck Rogers character created by Philip Francis Nowlan that had been featured in comic strips and novellas since the 1920s, and on the CBS and Mutual radio networks, airing several times each week from 1932 to 1947. The series starred Gil Gerard as Captain William "Buck" Rogers, a US Air Force pilot who commands Ranger 3, a spaceship resembling the Shuttle that is launched in May 1987. Because of a freak combination of gases, he is frozen in space for 504 years and is revived in the 25th century. There, he learns that the Earth was united following a devastating nuclear war that began on November 22, 1987, and is now under the protection of the Earth Defense Forces, headquartered in New Chicago. The latest threat to Earth comes from the spaceborne armies of the planet Draconia, who are planning an invasion. Aiding him are Col. Wilma Deering (Erin Gray), a Starfighter pilot, and Dr. Elias Huer, head of Earth Defense Forces, and a former star pilot himself. Actor Allusion: In "A Blast for Buck", Legion of Death leader Kellogg is on the long list of suspects who may have sent the deadly riddle. Appropriate as Kellogg was played by Frank Gorshin, who once played a Riddler. After the End: The series proper takes place 504 years after a nuclear war on November 22, 1987. Alternate Universe: The two-part episode "Flight of the War Witch". Always Save the Girl: Subverted in "Hand of the Goral" where the Evil Alien puts Buck through a Sadistic Choice, having to choose between saving Wilma Deering and Hawk (an alien from a Proud Warrior Race of birdmen). He chose Hawk because he guessed that the cowering Wilma was really a double put in by the Evil Alien, reasoning that the real Wilma Deering wouldn't have been such a wuss. When Buck makes his decision, "Wilma" melts right down in front of him, into a puddle of smoking burnt stuff. Ancient Astronauts: Part of Hawk's backstory; his race lived on Earth in the distant past until humans drove them into space. The Computer Council, although the only member we got to see regularly was Dr. Theopolis. Ascended Fanboy: Tim O'Connor as Dr. Huer. Badass Grandpa: All members of the title squadron in "Return of the Fighting 69th". Including one Badass Grandma. Banana in the Tailpipe: Buck's master plan to foil Ardala's surprise attack on Earth in the pilot movie — load missiles into the exhaust pipes of the Draconian fighter ships. A few seconds after takeoff... BOOM! Beware the Superman: A regular plot in the first season. Bilingual Dialogue: Twiki communicates in beedees as well as in English. Buck can eventually understand them, although initially he needs Dr. Theopolis to translate. Bizarre Taste in Food: In-universe. President Hieronymus Fox, who is also from the 20th Century like Buck, is a ten-year-old genius who insists on "real food": cheeseburgers, French fries and milkshakes. Since cows are extinct, he is able to substitute it with meat of the "Rigellian mountain lizard". When one of the mooks who kidnapped him almost starts retching at the thought, he quips, "Wait until you hear what's in the milkshakes!" Blunt Metaphors Trauma: Everyone initially has trouble understanding Buck's 1980s idioms. Twiki picks it up fairly quickly because he practically lives with Buck, and Wilma and Dr. Huer eventually learn to infer meaning from context, but Dr. Theopolis never quite gets the hang of it. Boxed Crook: After capturing Hawk in the second season premiere, he's effectively left in the custody of Buck and the crew of the Searcher. Hawk agrees to cooperate in the hope that they might find other Lost Colonies of his people. But for Me, It Was Tuesday: To take the place of a noted killer, Raphael Argus, Buck confronts the man in a bar, claiming to be the brother of one of Argus' victims. It works as Argus has killed so many men, he doesn't even recall the fake name and even shrugs "figured something like that," indicating he's used to being attacked by grieving family members. By the Eyes of the Blind: The Vorvon in the episode "Space Vampire" could only be seen or heard by its intended victim. Canon Discontinuity: A viewer who missed the opening episode could easily go the whole series without realizing there was a radioactive wasteland full of savages waiting just outside New Chicago. And that's just as well, perhaps. Captain Ersatz: Dr. Theopolis & Twiki for C-3PO and R2-D2. Retired Badass General Gordon, part of the Ragtag Bunch of Misfits brought in to fight an invasion in the second episode, is played by Buster Crabbe — who of course played Flash Gordon in the old serials as well as the original Buck Rogers. General Gordon: I've been doing that sort of thing [blasting starfighters] since before you were born, Colonel. General Gordon: Young man, I know so. In the second season episode "Journey to Oasis", Mark Lenard plays another alien Ambadassador. Chickification: Wilma lost a lot of her martial airs in the second season Retool. Clip Show: The episode "A Blast for Buck". Clothing Damage / Carpet of Virility: Gil Gerard's hirsute chest is displayed on more than one occasion. Comic-Book Adaptation: Gold Key Comics published an adaptation of the movie, followed by about 10 issues of original stories. It stands as the last TV series to be adapted by Gold Key, which used to get the rights to virtually every action-adventure TV series and sitcom on the air back in the 1960s. Comic-Book Movies Don't Use Codenames: Killer Kane he's not. He's just plain Kane. Cool Gate: The stargates (no relation). The Searcher from the second season. Coy, Girlish Flirt Pose: Wilma, on occasion. Crystal Spires and Togas: The city of Oasis. New Chicago looks pretty sharp as well. Daddy's Little Villain: Princess Ardala of Draconia is at least as evil as her father Emperor Drako. Defrosting Ice Queen: Wilma Deering. Dig Attack: The episode "Unchained Woman". As Buck and his fellow prison escapee Jen Burton are trekking across a desert, Jen is attacked by an underground monster that uses a tentacle to pull her into its clutches. Distressed Dude: More often than not, the episodes are driven by a villain holding Buck captive. The Dragon: Tiger Man. (His name is a Shout-Out to the Martian Tiger Men of the original comic.) Later replaced by Panther Man. The Empire: The Draconian Empire. Enemy Mine: Buck and Hawk, at the beginning of the second season. Hawk then joins the heroes. Evil Diva: In "Space Rockers", the music of the band Andromeda is used by their producer to drive the youth of the galaxy to riot in a bid for power. Exty Years from Now: Averted. Buck stays frozen for a non-round 504 years. Eye Beams: ODX from "Journey to Oasis" — his are telekinetic and resemble lightning. Fakeout Escape: In "Flight of the War Witch", Buck, Princess Ardala and a Pendaran captive use this to get out of their cell. Buck and the captive use a Ceiling Cling to hide, while Princess Ardala simply hides under the bed. Fan Disservice: In the "Space Rockers" episode: Lennie Briscoe and Bull in spandex. Good luck sleeping tonight. Erin Gray in spandex jumpsuits and miniskirts. Pamela Hensley in even less. And the opening credits to the theatrical version of the pilot episode. Fire-Forged Friends: Hawk and Buck. Flanderization: Buck's actor Gil Gerard complained that Buck was cracking too many jokes and that the Fish out of Temporal Water aspect of Buck's character had gotten stale. This may be why Buck gets a lot more serious in Season 2. In addition, his relationship with Wilma becomes more serious instead of a different Girl of the Week. Flying Weapon: A subversion in "Journey to Oasis"; Ezerhauden is really an invisible swordsman, vulnerable only to a thrown spear type of attack, but until he is killed, he resembles a flying self-wielding sword. Food Pills: In "Planet of the Slave Girls", they become an important plot point; the manufacturer was poisoning them. Forgotten Theme Tune Lyrics: The theme tune had lyrics that were sung by Kip Lennon during the opening credits of the original Pilot Movie. The Future: Buck wakes up in 2491. There were few records of the 20th century, so 25th century historians confuse a hairdryer with an "early model hand laser". In "Return of the Fighting 69th", a 20th-century belt-fed machine gun is mistaken by the bad guys for an "ancient communications device". They are quite surprised when a captured Buck demonstrates its proper use during his escape. Future Music: Complete with an entire episode devoted to the idea. Future Spandex: In the first season, Colonel Deering and Buck sometimes wore spandex jumpsuits. Major Danton: Recon One, I appreciate your concern, but I'd appreciate it all the more if next time you'd refrain from interfering in a Directorate training mission! Buck: What? If you call that "interfering", there's something wrong with your Funk & Wagnalls! note This is actually a Rowan and Martin's Laugh-In reference; they would regularly direct the viewer to "look that up in your Funk and Wagnalls", a famous brand of dictionary. Girl of the Week: To the point where they did a Lampshade Hanging of it halfway through first season. Hammer and Sickle Removed for Your Protection: In "Testimony of a Traitor" it was revealed that just before Buck left Earth, there was a conspiracy of high-ranking American officers to launch a first strike against "The Other Side". A one-shot character by the name of Toman, who used his heightened strength to become a hitman. Another heavy-worlder in an earlier episode had telekinetic powers. HeelFace Turn: The super-powered minion Varek in "Plot to Kill a City" refuses to allow the plan to go through because it would doom the survivors to the same torment as the people of his own world. Heel Realization: In "Flight of the War Witch", Ardala confronts a far crueler villain than herself, who then proceeds to destroy all Ardala's personal Jerk Justifications and makes her realize what a spoiled, pathetic wretch of a person she is. She later comes to Buck in tears, and he's basically sympathetic; he's always viewed her more as spoiled and naïve than really evil. Zarina: [to Ardala] On the contrary, we couldn't be more different. I have earned my position. You've been given yours. Heroic Sacrifice: Subverted in "Plot to Kill a City" as, after a HeelFace Turn, Varek tries to shut down an overloading reactor core that would blow New Chicago off the map. He does but is seemingly vaporized, the group mourning him. Just as Buck says "I wonder if he realized he saved us," Varek shows up behind them, having just managed to escape in time, albeit badly injured. Thanks to his effort, he's pardoned for his past crimes and allowed to return to his home world. Inspector Javert: The android guard in "Unchained Woman" never ceases his pursuit of Buck and Jen. Insufferable Genius: Crichton, who substituted for Dr. Theopolis as Robotic Smart Guy in the second season. However, at least in "The Crystals" he was willing to admit to a serious mistake in his findings about the terrible fate of the humanoid beings of a planet degenerating into mindless monsters; he found that he got the process completely backwards and the brutes were actually metamorphosing into sapient beings. Invisibility: Ezerhauden in "Journey to Oasis". The reason Odee-X could not defeat him. Ironic Echo Cut: When Buck is on trial and Dr. Theopolis is defending him. Dr. Theopolis: We haven't a thing to worry about. Judge: Captain Rogers, the council finds you guilty. Kill Sat: The Draconian weapon in "Escape from Wedded Bliss". Lady Land: The planet Xantia, as seen in "Planet of the Amazon Women". The Lancer: Hawk from the second season. Last of His Kind: Hawk, the last survivor of a Lost Colony of hawk-people. 20th-century weaponry (including the nerve gas the bad guys have stolen). Sign language (almost unknown in the 25th century) to communicate with a mute servant girl who proves critical to the plot. Electricity (an obsolete technology in the 25th century). It being obsolete is used inconsistently, as another episode has Buck being zapped by Twiki to thwart the villain's plan. Gambling ability in a computer-driven casino. He wasn't even counting cards — he was just the only one able to add. Adapting American football plays for use by the Earth Defense Directorate's pilots in squadron maneuvers. Buck is also apparently the only pilot employed by Earth who is not completely dependent upon his ship's targeting computer because of his 20th-century dogfighting skills. A Little Something We Call "Rock and Roll": Both in the original pilot movie and in a later episode about space rockers. Mechanical Life Forms: Earth's Computer Council (Dr. Theopolis and his colleagues) are descendants of A.I. that reached the point of building and programming themselves; they're treated as citizens, and viewed as the saviors of humanity after the nuclear apocalypse. Memory Gambit: In "Testimony of a Traitor", Buck finds himself on trial for causing World War III. In fact, he had allowed himself to be brainwashed in order to infiltrate a conspiracy in an unsuccessful attempt to prevent World War III. It's stated that Buck's mission succeeded. World War III just happened in spite of his efforts. Military Science-Fiction: In effect it was two shows, with the first season being James Bond Recycled In Space, and the second being a full-out Science Fantasy. Buster Crabbe, who played the title role in the 1939 serial Buck Rogers, guest starred as Brigadier Gordon in "Planet of the Slave Girls". Buck being revived in the year 2491 is an obvious reference to the title of the original Buck Rogers story, Armageddon 2419 A.D.
New Neo City: New Chicago, New Detroit, New Manhattan, New Phoenix, New Tulsa, Boston Complex, New London, and "City-on-the-Sea" (formerly New Orleans). Averted by the episode "Vegas in Space" in which the orbital casino is named Sinaloa (but bears no resemblance to the Mexican state of the same name) and, other than Buck, none of the characters draw a connection between Sinaloa and Las Vegas. New Old Flame: Mark Lenard's character to Wilma in "Journey to Oasis". Nice Hat: Princess Ardala's horned headdress in the pilot is only the first of a long line of fancy crowns and headresses — which no straight male viewer ever notices. No New Fashions in the Future: Buck's civilian clothes wouldn't look out of place in the late 1970s. The other characters wear clothing that at least looks futuristic (albeit Zeerusted). Not Quite Dead: At the end of "Plot to Kill a City", Kellogg (played by Frank Gorshin) was apparently blown away in a climactic space battle. In "A Blast for Buck", however, although Buck felt that Kellogg wasn't the one who sent the weird yo-yo doomsday message device, he knew that Kellogg was still out there and really pissed at Buck. Older Than They Look: In "Return of the Fighting 69th", Buck notes that the members of the squadron don't look any older than 60 when Wilma informs him that they've all reached the mandatory retirement age... of 85. Old School Dogfight: Pretty much used in every episode. With the same stock footage almost every time. "The year is 1987, and NASA launches the last of America's deep space probes. In a freak mishap, Ranger 3 and its pilot, Captain William "Buck" Rogers, are blown out of their trajectory into an orbit which freezes his life support systems, and returns Buck Rogers to Earth... 500 years later." It was changed for the second season, as shown with the article quote, this time delivered by Hank Sims. Both versions were abbreviated and altered from the narrative of the original pilot movie, which was longer. Our Vampires Are Different: The episode "Space Vampire" has a creature called a Vorvon. It has the abilities of Hypnotic Eyes, Shapeshifting (to a floating red ball of light), Vampiric Draining (of Life Energy), Invisibility to electronic viewing and turning the humans it killed into zombies. It can be fended off by a "power lock" instead of a crucifix and is Weakened by the Light of the sun. Pleasure Planet: The episode "Vegas in Space". Proud Warrior Race Guy: Hawk in the second season. Wilma: Yes. Let's see. Now, there's, um, Jen, Joella, Marla, Alison, Tangie, Falina, Miss Cosmos. I do believe that there is a pattern emerging here. 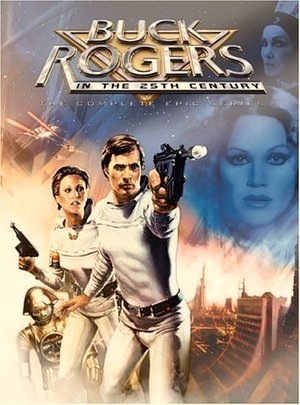 Really 700 Years Old: Buck Rogers was born in 1957, and is doing his thing in the 2400s. Recycled In Space: Space mummies and space vampires, among others. Red Eyes, Take Warning: The space vampire. Retcon: In the second season, Twikki and the other robot aboard the Searcher are specifically described as Three-Laws Compliant. Which directly contradicts the two-parter "Planet of the Slave Girls", which has Twikki flying a starfighter and blasting away at enemies. The second season, which tried to Follow the Lead of Battlestar Galactica and Star Trek. To a lesser extent, the first season is retooled from the pilot movie, where Earth was a scaredy-cat backwater burg compared to the rest of the galaxy with roaming gangs of mutants in the barren regions between cities, and where New Chicago is the only point of civilization. The TV series retooled this to feature numerous cities on Earth, and with the planet being part of an interstellar community. Although some things said in Flight of the War Witch imply that Earth has only recently joined the interstellar community, following their development of the now-ubiquitous Stargates, with the first person to ever use one still being alive. The first season has multiple, independent human factions, some of which (like the Draconians) being hostile to Earth. The second season shows humans as highly fragmented, and the whole point of the Searcher is to try locating and establishing contact with all the lost colonies. Ridiculously Human Robots: Most of the computers and androids have some kind of Personality Chip. A few actively despise humans as lower life forms. Robot Buddy: Twiki, one of the Trope Codifiers. He may look rather innocuous, but he can pilot a fighter and dogfight with the best. Robot Me: Three of them, actually, in "Ardala Returns". Ardala: Captain Buck Rogers, meet Captain Buck Rogers. Buck's cooking and use of 20th century slang. 25th century natives, including historians, who completely misunderstand the function of common 20th century items. In "Plot to Kill a City" part two the intercom pages Adam Strange and those departing for Thanagar. In the episode "A Dream of Jennifer", the intercom can be heard paging Norrin Radd as Buck is arriving, and Captain Christopher Pike a short time later. The second season has the character Admiral Asimov, as well as the assertion that Twiki and Crichton are equipped with positronic brains. Lampshaded by Crichton — see Three-Laws Compliant below. Lampshaded in "A Blast for Buck". The doomsday device came with a riddle. Kellogg from "Plot to Kill a City" is one of the suspects. Buck decides, however, that Kellogg "... wouldn't be bothered with riddles, it's not his style. When he decides to come for me, he'll want me to know it's him, how he's gonna do it and how much it will hurt." Not what we were expecting as Kellogg was played by Frank Gorshin who is definitely known for his riddling tendencies elsewhere. Gary Coleman's recurring guest character, Hieronymous Fox, is named after the creator of The Garden of Earthly Delights, Hieronymous Bosch. Signed Language: In the "Return of the Fighting 69th", Buck encounters a young deaf girl named Alicia, being held as a slave on an asteroid by space pirates. Showing a previously unknown ability to use ASL, Buck communicates with her to help with his and Wilma's escape after they're captured. Slept Through the Apocalypse: Buck Rogers was frozen when World War III broke out. Smoke Out: In the episode "Vegas in Space", Buck has devices which cause a complete blackout in the immediate area. He uses one to escape from enemies. Space Fighter: The starfighters are some of the most gorgeous ships of this type ever designed. They were rejected models from Battlestar Galactica. Space Opera: The series is based on one of the Trope Codifiers, Buck Rogers. Spared by the Adaptation: Ardala's bodyguard, Tiger Man, was killed in the pilot movie; the TV series version of the story let him live to reappear in future episodes. Stock Footage: In addition to the previously-mentioned stock footage of space combat (of rejected fighter designs from Battlestar Galactica), the first season also has about three stock establishing shots, two of which were also recycled from Battlestar Galactica. Stripperific: Pamela Hensley as Princess Ardala wore very, very little. Three-Laws Compliant: Twiki and other Earth-made robots are explicitly Three Laws Compliant — Twiki even quotes the First Law in the second season episode "Shgoratchx" and a few moments later states all three of them after having his brain inserted in Crichton's body. Crichton even complains about this in one episode, mentioning that the creator of the Laws had the same surname as the ship's commander. Time Travelers are Spies: Buck is accused of being a Draconian spy in the pilot movie; his defense against the charge is not helped by the Draconians having installed a tracking device aboard his space shuttle. Buck then has to redeem himself in the eyes of Earth by sabotaging the Draconian surprise attack on Earth—during which he is again mistaken for a Draconian agent by Doctor Theopolis and Twiki. Trapped in Another World: In the two-part episode "Flight of the War Witch", the Pendarans send a distress call through a vortex to summon Buck, Dr. Huer, Wilma and Princess Ardala's entire flagship into their universe to help them defeat her. Ultra Terrestrials: Hawk's race evolved from birds and left Earth eons ago. The end credits to the pilot feature the theme song's lyrics. And the theatrical version of the pilot features Fanservice images of a swimsuit-clad Pamela Hensley, Erin Gray and an uncredited model. The TV version just uses a standard starfield. The theatrical opening credits also feature the vocal version of the theme song (which is titled "Suspension"). Un-person: In the TV series, part of Dr. Huer's argument in favor of Buck becoming a special agent is that, at least at the beginning of the series, he had no legal identity. Verbal Tic: Twiki adds "Beedee beedee beedee" to the beginning or end of most sentences, except for the episodes in the second season where Mel Blanc is not doing his voice. Villainesses Want Heroes: Princess Ardala to Buck Rogers, sometimes. Although the only time she makes a really HARD play for him is when she needs a suitable mate to keep her throne. She doesn't get Buck, of course, and it's unclear if she keeps her throne or not. Villainous Breakdown: Ardala, in part 2 of Flight of the War Witch. Ardala: [snaps] Yes, I'm fine! Ardala: I said, I'm FINE. Buck: Alright, just making sure. Ardala: [pause] Buck. I'm NOT fine. I'm HORRIBLE! Weather-Control Machine: Terran weather is manufactured by Quads because the Earth's ecosystem was destroyed in The Fall. Dr. Theopolis is personally responsible for weather at New Chicago and is particularly proud of his sunsets. We Need a Distraction: Anytime Buck needs to get out of a detention cell, or slip past some guards. Most involve a cellmate pretending to call for help, and when the cell is opened, Buck jumps the guard(s). We've Got Company: "Stop breathing, we've got company!" World War III: World War III broke out on November 22, 1987, only six months after Buck was frozen, when the Soviet Union launched an all-out nuclear attack on the United States, destroying all of its major cities. The US counterattacked, devastating the Soviet Union, and a second wave of missiles was launched against it. Millions of people were killed in the war and millions more died of radiation poisoning in the coming months. Many humans and animals were mutated by the radiation. Society very quickly broke down.